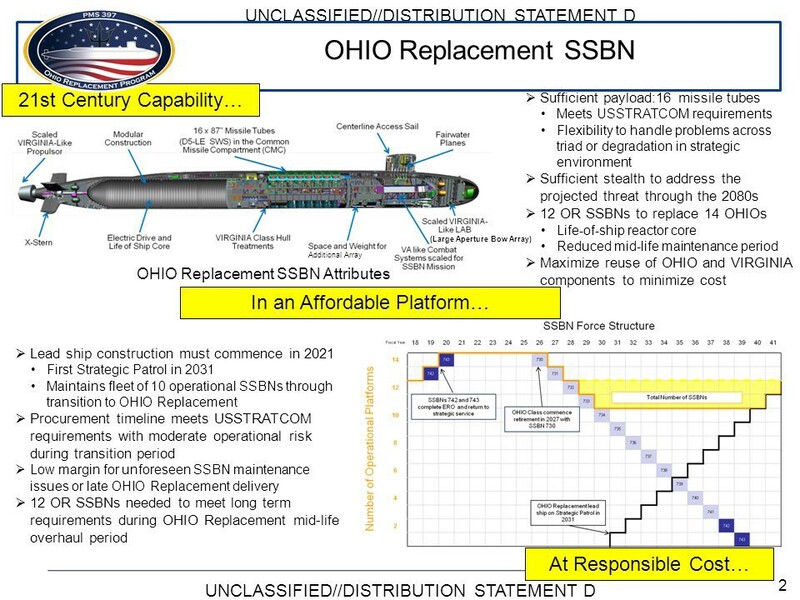 General Dynamics’ storied Electric Boat division is set to deliver its detailed design proposal for the new Ohio Replacement Program (ORP) ballistic missile submarine to the U.S. Navy this Friday. That will kick off a series of events, which will culminate with Electric Boat signing a contract to design and build the new “boomer” in the fall after a Milestone B review in August. That’s assuming the Congress manages to pass the fiscal year (FY) 2017 budget. With construction of the new ballistic missile submarine set to begin in fiscal year 2021, the goal is to deliver the first boat in time to conduct its first deterrence patrol in October 2030. Unlike with the Virginia-class attack submarine, Electric Boat will be the sole prime contractor and will be responsible for delivering all 12 ORP boats to the Navy. However, while Electric Boat will be responsible for 80 percent of the work on the ORP, Huntington Ingalls Newport News — the only other shipyard capable of building a nuclear submarine — is heavily involved in the design and build phase. Newport News has a total responsibility for about 20 percent of the boat’s design and construction — about 300 of the company’s engineers are working with Electric Boat to design the new submarine. Dividing up the work in this manner will help to preserve the nation’s critical nuclear submarine engineering and manufacturing skills. The Navy expects the new arrangement to drive down the learning curve for the new boomer and reduce costs by having only one prime contractor. “The decision here was to facilitize Electric Boat and have EB do all 12 deliveries of the Ohio Replacement, put down one learning curve over 12 ships,” Capt. David Goggins, Naval Sea Systems Command program manager for the ORP, told an audience at the Navy League’s Sea, Air and Space symposium on May 17. In an attempt to minimize costs, the Navy drew upon as much technology from the Virginia-class as possible. However, there are some major differences between the two designs — especially towards the stern of the vessel. The ORP is designed to have greatly improved survivability. The Navy emphasized stealth and survivability because of the boat’s critical nuclear deterrence mission — the ORP has to be survivable through 2080 in order to guarantee America’s nuclear deterrence, Goggins said. Even though the detail design phase has yet to start, work on many critical aspects of the program have already started. Electric Boat will complete the submarine’s common missile compartment (CMC) arrangements before the end of this year. “We’ll start our prototyping of the missile compartment this year, this summer,” Goggins said. The idea behind the prototyping is to reduce risks associated with the new missile compartment — which should also help to reduce manufacturing costs. Moreover, the British — who will also use the same missile compartment design — are expected to start construction of their new Successor-class ballistic missile submarines in the coming months. That means that the Royal Navy needs to have the CMC design completed and proven before they install those modules onboard the first of their new boomers. The design and construction of the CMC is one of the four major technical innovations onboard the ORP. When the Ohio-class was designed and built, empty missile tubes were simply welded into the hull. Workers would insert the electronics and other hardware necessary to make those tubes work later in the construction phase through various hatches and other openings. The OPR uses a completely new method. Instead of inserting one tube at a time into the hull for later outfitting, the CMC is built as part of a section with four tubes built-in — called a Quad-Pack. The four tubes are manufactured and fully outfitted before being combined into a single module for installation. That module is then inserted into the hull as a unit. The ORP will be fitted with four Quad-Packs to carry a total of 16 submarine launched ballistic missiles — but the smaller British Successor-class would only be fitted with three such units for a total of 12 missiles. Theoretically, if the ORP’s other systems could support the additional weight and power requirements, adding more missiles to the design would simply mean adding additional Quad-Packs. The tubes are the same 87-inch diameter vessels as the current Trident II D5 launchers on the Ohio-class, but are a foot longer — leaving some margin for a future missile design. Another major innovation onboard the ORP is the boat’s 42-year life-of-the-boat nuclear reactor — which is being developed by the Office of Naval Reactors. While the Virginia-class also has a life-of-the-boat reactor, the U.S. Navy has never designed and built a reactor with the kind of longevity as the powerplant being designed for the ORP. One other major innovation onboard — and one that will be carried forward onto future U.S. nuclear submarines — is the ORP’s permanent magnet motor electric drive. Lennon said that there is not much more that can be done to reduce a submarine’s acoustic signature using mechanical means — moving to a permanent magnet motor opens up much great potential for stealth. The OPR will not be the first American nuclear submarine with an electric drive — in the late 1950s, the one-off USS Tullibee (SSN-597) pioneered the technology. Later, in 1960s and 1970s, the U.S. Navy built the USS Narwhal (SSN-671) and USS Glenard P. Lipscomb (SSN 685) to test turbo-electric drives — but the technology proved to be troublesome. However, Lennon said that electric drives have come a long way since those early days of Tullibee — rather than direct current the new motors use permanent magnets. Permanent magnet motor technology is well understood in terms of performance and engineering. While there have been rumors that the ORP is larger than its Ohio predecessors because of the size of the electric drive and its permanent magnet motor — despite carrying eight fewer missiles — Lennon said that is not true. The ORP will be larger than the Ohio-class because of the enhanced survivability measures integrated onboard the submarines — the new boats will displace more than 20,800 tons. Indeed, the Navy could have opted to build the boat with 20 or 24 missile tubes, but chose not to in order to make sure the United States dispersed its nuclear deterrence. While he could not go into detail, Lennon said those mission needs include performance — including survivability and acoustics. “We’ve had to designate larger volumes in order to put certain features and capabilities into the ship,” he said. One other visible difference between the ORP and previous U.S. nuclear submarines is the X-plane tail surface configuration. The new configuration is needed to meet the Navy’s hydrodynamic performance requirements for the new submarine, Lennon said. The last time the U.S. designed X-plane controls for a submarine was when America was still building diesel-electric boats. ORP also moves the submarine’s dive planes to the sail to ease maintenance issues — a boomer needs to have high availability. While Lennon could not talk about how the ORP would perform, another industry source said that though a boomer’s handling is not quite as spritely as an attack boat like the Virginia class, the performance differential is not as great as one might imagine. In fact, there is not that much difference in terms of speed, maneuverability and diving performance. In terms of combat systems, sensors and self-defense weapons — most of the ORP’s systems are common with the Virginia class. The ORP’s combat systems will be the latest version from the Virginia class — indeed the two classes will share upgrades and software even though the ORP won’t need all of the functionality that an attack boat needs. Theoretically, the ORP — whose torpedo room design is also very closely related to the Virginias — would be able to support cruise missiles like the Tomahawk, but it is highly unlikely that the Navy would ever use that ability. “The intent is their whole upgrade system … would be common across SSNs and SSBNs to the extent the capabilities are needed on both,” Lennon said. One of the major downsides of the ORP program is that it is expensive. The total program is expected to cost more than $97 billion in constant FY2016 dollars according to the Congressional Research Service. That includes about $12 billion in research and development costs and about $85.1 billion in procurement costs. The Navy hopes to reduce the cost of each submarine — following the initial boat which is going to be much more expensive — to about $4.9 billion. However, thus far, while the service has made progress, the projected price tag remains at about $5.2 billion — but Electric Boat has been “incentivized” to reduce cost. “We’ve done a lot of work last year on cost,” Goggins said. The U.S. Congress — particularly Rep. Randy Forbes (R-VA), chairman of House Armed Service Committee’s Seapower and Projection Forces subcommittee, and ranking member Rep. Joe Courtney (D-CT) — have worked hard to setup a National Sea-Based Deterrence Fund to help the Navy to pay for the program. If the Navy had to pay for the ORP out of its shipbuilding accounts, it would all but decimate the service’s regular ship construction coffers — consuming money for attack submarines, surface ships and even aircraft carriers. Thus, Congress and the Pentagon have to find someway to pay for the ORP without damaging the Navy. The Pentagon and Congress set up a separate fund to pay for the original Ohio-class to secure America’s nuclear deterrent — the country will likely have to do so again to pay for the ORP.